Lately I’ve been thinking about BIOS updates. More specifically the fact that I’ve needed to apply them to some of my older HP Desktops and Laptops so we could deploy Windows 10 1511 reliably. Moving forwards this was going to be an issue as we are looking to upgrade our entire business to Windows 10 CBB later in the year. I definitely did not want to be in a position where we were manually updating BIOS versions. 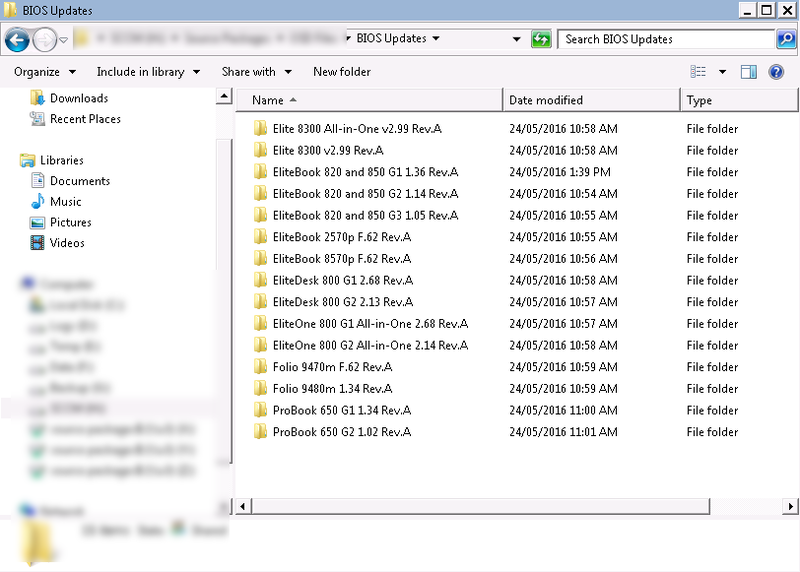 Here is a solution to update your BIOS versions using a Configuration Manager task sequence. I’ve focused on HP however the solution I have implemented would work for any vendor, just adjust to suit the utility they offer. And yes to all those SSM fans out there, I know that you can add a step to update the BIOS using that HP utility against a SSM downloaded management source with all the HP updates, however I’m not a fan and have chosen not to use it for various reasons specific to my environment. So the requirements. Well that depends on what your already doing. 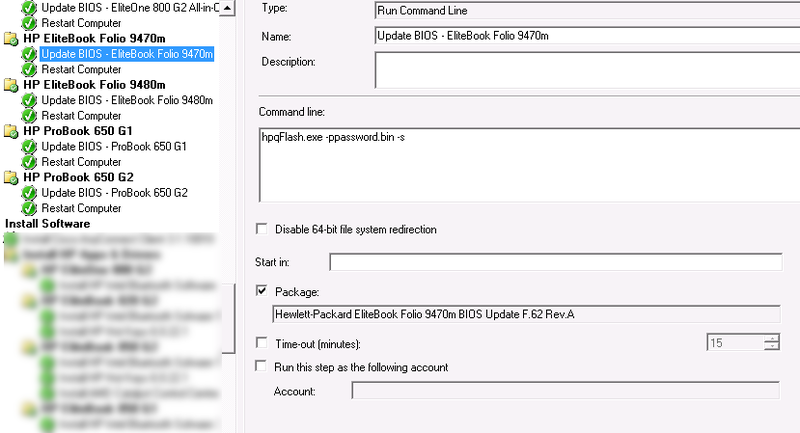 If you are enabling BitLocker as part of your Task Sequence then you should already been using the HP Bios Config Utility to enable your TPM and set your BIOS settings using something like BiosConfigUtility.exe /Set:TPMEnable.REPSET /nspwdfile:”password.bin” as part of Run Command Line step with a package. You will need to use your password.bin file as part of our BIOS update command as you can’t update a BIOS automatically unless you pass the password through as part of the command. Also note that if you try to update a HP BIOS and you have bitlocker enabled there is a suspend bitlocker switch which I haven’t needed to use. But its nice to know its there. 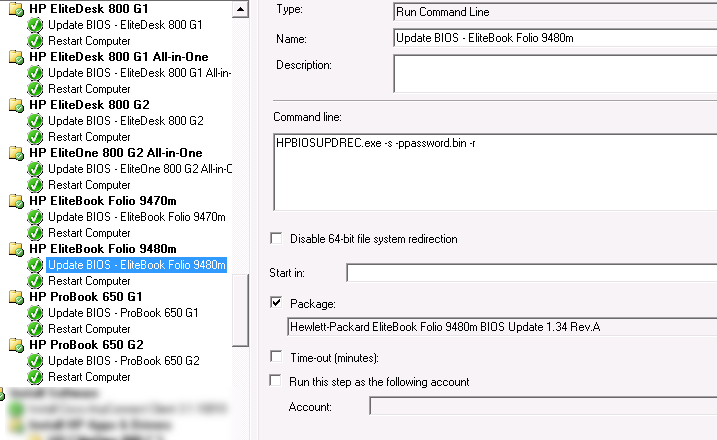 Here is a link to the HP BIOS Configuration Utility Guide which also explains how you can you generate a password.bin file if required. I have my enable TPM / Import REPSET file steps before my Update BIOS steps in my task sequence. This is to ensure that the devices BIOS settings are always configured with a password before my BIOS update step runs. This avoids the scenario where a BIOS update is attempted using a password switch where that device doesn’t have a password set. Clear as mud? Having said all of this, if you don’t set passwords for your BIOS or don’t enable BitLocker then ignore the last few paragraphs! Once this has been completed, create a package for each BIOS update without a program and distribute them to your DP’s. Now add some update BIOS steps to your Task Sequence. As mentioned before I have my update steps after my BIOS REPSET import settings step (which enables the TPM etc). This occurs after the PC has rebooted following the Setup Windows and ConfigMgr step. Create a folder for the model of PC relevant to the BIOS update, then set a WMI Query so it will only run against that model. This is what you would most likely be doing for driver packages. You don’t need to worry about using anything sneaky to query the SMSBIOSVersion against the Win32_BIOS class. If the BIOS version is up to date, the utility just exits and the task sequence continues. For newer models that use HPBIOSUPDREC.exe specify the command HPBIOSUPDREC.exe -s -r. Again if you have a password set use HPBIOSUPDREC.exe -s -ppassword.bin -r.
The last step is to add a Restart Computer step which is an absolute must for obvious reasons. That’s pretty much it, Happy BIOS Updating! Great info! Will be doing just that. Just one thing though: wouldn’t it be more efficient to put only one Restart Computer at the end of the Update BIOS step instead of one for each machine (and less bloating, too)? Yes you could definatley do it that way, I’ve structured my Task Sequence that way to make it easier for me as a personal preference to see each model and understand what the sequence is doing. I receive the following message when making changes to the hp bios config. How do you automate this message? Can you post the content of your repset (configuration) file? Thanks for that info so far. We do this allready a couple of years for HP Devices during OS Deployment. Now we want to do it for Machines running with OS without resetup the OS. How would you do this? With a task sequence? Required or availlable? I tried it with a TS, but the problem is, that there are several reboots necessairy and the TS needs more than 5 minutes to restart after a reboot. Meanwhile the user starts working and his work will be interruppted several times. Any suggestions? How would you do it? Apologies for taking so long to reply as I’ve been on holidays. I have’t looked into the requirements around updating BIOS versions for machines already running an OS. You could look into suppressing the reboot using a package in Configuration Manager? Other than that, the only other thing I can think of would be the leverage Wake On Lan to wake up the PC’s overnight and apply the BIOS update. Damon, I just wanted to say Thank you for this article. This seriously saved me a lot of time. But, I’ve got a problem to correctly update the HP X2 1012 G1. After the HPBIOSUPDREC command, I’m trying to restart into WinPE (restart computer – assigned boot image), because I have to apply BIOS configuration. During WinPE restart command, it’s directly crash ; WinPE seems not to be staged for the next boot (general error code 0x8007000F). When I read the smsts.log, there is no error ; the smsboot.exe /target:WinPE is executed, with result 0. The problems seems to be due to the BIOS method update for this model, maybe it recreates partitions or something that break WinPE staging ? Has somebody got this issue ??? Is the X2 1012 G1 and enterprise class device? If it is you should be able to contact HP and get assistance from your local rep. If it isn’t then I’m afraid there may not be a way to automate the BIOS update without intervention. There is big difference with HP enterprise and non enterprise class devices unfortunately. It could also be an issue with that BIOS – so either way you should report it to your HP rep. They are pretty good at providing assistance. How did you get your task sequence to proceed if the BIOS version was already up to date? I tried running this task on a Folio 1040 G3 that already had the latest BIOS version and the task sequence failed. I’m thinking I could either set the task to proceed on failure or set up a WMI query to check the BIOS version first. I just have the continue on error box checked – you can control if the step applies or not as you have already mentioned using wmi queries, I just don’t bother. Deployment Bunny (website) has a good article and script. @John. I faced the exact same problem and I rather not use the “continue on error” option. IMHO the better solution is to add the exit codes to the “Success codes:” field on the options tab. This is much easier to manage by configuring and using the database option in MDT – especially given the number of different models you are supporting. Utilizing the database, you can assign the BIOS upgrades as a model specific applications instead of hacking additional steps into the Task Sequence. It also makes automating a raft of other model specific settings a breeze. Additionally, have a look at http://techgenix.com/Deploying-Windows-7-Part26/ for an alternative way of installing the correct drivers for each model as well with only two minor changes to the default Task Sequence. Not trying to say the way you’ve presented is wrong (it was the way I was doing it), but it got so unmanageably out of hand, I had to find a better way. YMMV. Please take these suggestions in the spirit intended – getting useful information out there. No worries Phil, always different ways to achieve a result 🙂 And its good for those who visit the blog and want to implement something in a different way. I’ve used the MDT database in the past. We lease our equipment so we always have a fairly static list of models. I am having some issues getting this to work and I hope you can help me out. I am using SCCM 1610 and I am trying to configure the BIOS in the task sequence using the “Run Command Line” step. Checkingt the SMSts.log I was able to trace the problem to that this commandline is not able to find “enableUEFI.txt”. I have checked the package and the local copy of the package (C:\_SMSTaskSequence\Packages\\), every file inculding the .txt file is there. So it adds the entire path where the executable is, but it tries to find the “EnableUEFI.txt” where the commandline is actually executed and that is not equal to “C:\_SMSTaskSequence\Packages\\”. I could just add the path to the Command Line, but I would rather not. What if the packageID for whatever reason changes? Then the path is incorrect. I want to keep the path flexible and not hardcode in the TS. I do not reference txt files and I user the /set switch not /setconfig. 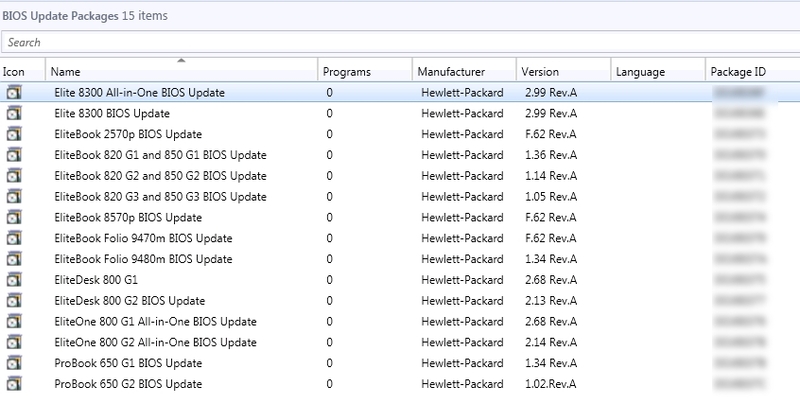 Currently I’m using version 4.0.15.1 of the HP BIOS Configuration Utility – probably not the latest, but I haven’t had a reason to update it. I was not able to find the problem nor the solution, although it did started to work all of a sudden, without adding the path. Thanks you so much for this site. Sorry if this has been answered above and I missed it. Is there a way to include\apply custom BIOS settings (i.e. boot order, etc.)? I think I have the concept of updating the BIOS to the latest version with SCCM. Is this something I should be trying with PE? We are an all HP shop. Thank you for your willingness to share your knowledge with us. Yes you can apply a combination of settings using the tool. Check out the documentation that comes with the BIOS Config Utility for the relevant switches that you can use to export and create a settings file for each of your models. I already do this in some cases to disable usb device booting. Would you be willing to share the bios/firmware configuration files for the following models? They are hp 820 G3, hp folio 9470m and hp folio 9480m? I’m banging head on the wall with these three models. No worries. My config simply enables settings for bit-locker so keep this in mind. What version of of HPQFlash are you using? I have tried 4.40.1.1, 4.50.1.1 and 5.1.26.1 which came with the lastest version of HP SoftPaq Download Manager, but I always get an eror message during OSD. Error 80004004, ‘This version is not compatible with the version of Windows you’re running.’ Did you coma accross this issue? My guess is that it may have something to do with the fact that I use x64 boot image (version 10.1.16299.15) and HPQFlash is a x32 app. I use the versions that come with the BIOS updates but I don’t believe this is your issue based on that error code. 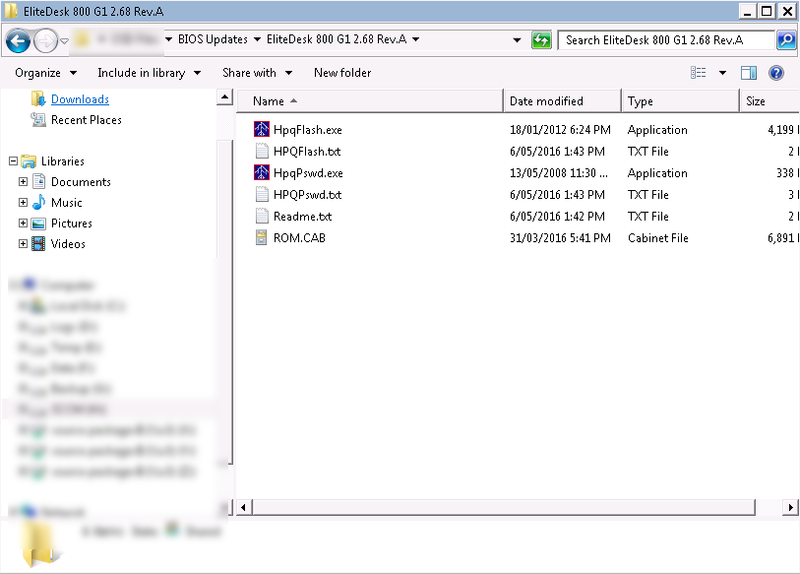 As you’ve already mentioned executing the HPQFlash 32-bit app in WinPE 64-bit doesn’t work. Try moving the BIOS update step to after the Setup Windows and ConfigMgr Task Sequence step or you could try specifying the 64-bit version that comes with the BIOS SoftPaq’s(HPBIOSUPDREC64.exe). Keep in mind though that HP doesn’t provide a 64-bit version of the BIOS update tool for older PC’s. I saw that it failed when it tried the update the BIOS, is it not able to locate the .bin files because they are not being copied locally? I don’t know why but they don’t seem to get paced anywhere. Hi Nick, yes should be achievable. Problem lies with your command. Create a script that executes the command, place in package source location then reference that script in the config manager package program install command. You could use batch or PowerShell. If using batch use the %~dp0 command to set the path to the exe and bin file when executing. There should be plenty of examples around if you search. Similar exists for PowerShell. Thank you Damon, I will be touching base with some of team that has more scripting and Powershell experience than myself. I have recently used a combination of Application Model, Powershell script and task scheduler to Suspend bitlocker, upgade BIOS and then resume bitlocker(task scheduler). I’m hoping I could be able to use same method for HP. We have Windows 7; 64-bit in our environment. My question would be what is the command line arguments to use? So, for Windows 7, 64-bit should I use HPBIOSUPDREC64.exe OR HPBIOSUPDREC.exe; to generate password.bin HpqPswd.exe OR HpqPswd64.exe? I’ve read if generate password.bin using 64-bit file, it didn’t work. 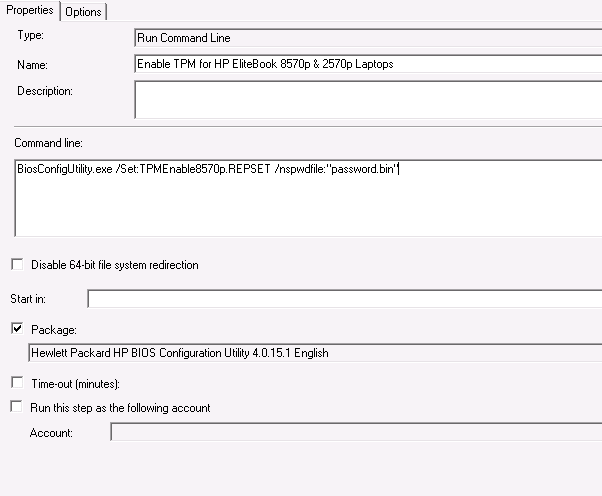 Ive always used the HP Bios Configuration utility to generate the password.bin file. I have tried your method which is working like champ, but i was insisted to use SCUP to update the HP Bios from SCCM. Can you suggest is it a good options to use SCUP for upgrading the BIOS over the task sequence method for new build machines and existing machines. ? It’s possible however I haven’t looked into it yet. Downside that immediately come to mind would be issues applying the Bios updates when you have Bitlocker or similar disk encryption enabled, Tpm would need to be suspended, not sure if Scup can handle this. Hi Damon, Thanks for your reply, that’s true even I was bit confused how to handle for the bit locker enabled machines . Thank you for this article, there’s a lot of very good information in here. I wish HP would release some sort of file inventory that included what each file is for all in one location. 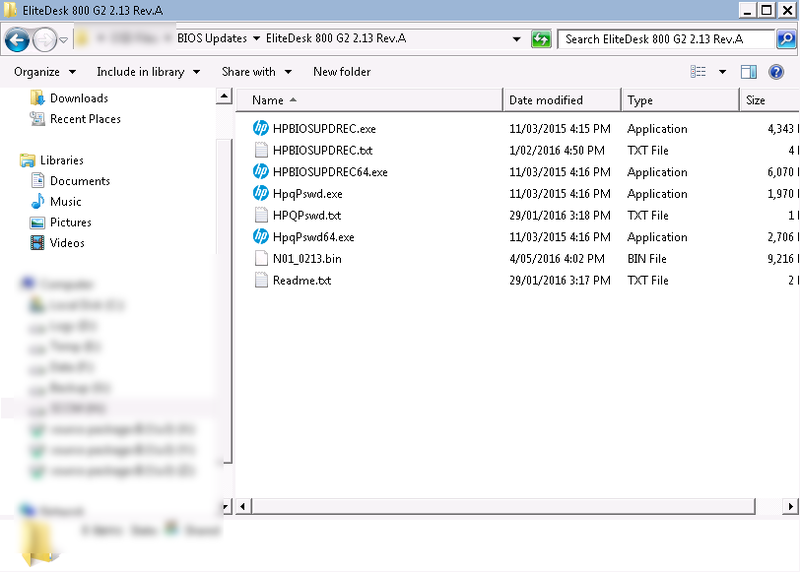 What is the difference between HPBIOSUPDREC.exe and HPBIOSUPDREC64.exe? I have not been able to find a reference to HPBIOSUPDREC64.exe anywhere except in Steve’s reply above.